The Queen & Her Court II BOM Quilt - Two Sizes! Programs - Most Include Backing! > The Queen & Her Court II BOM Quilt - Two Sizes! Queen & Her Court II - Queen or King! Note: The King size has fabric to add additional blocks on the sides to build the center out to a square. 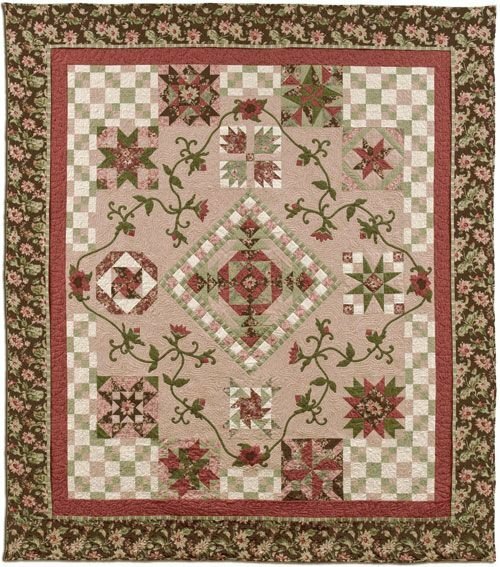 Originally released in 2009 as a 12-month program the lovely Queen & Her Court pattern has been updated with a fresh block designs and piecing techniques to reflect today's quilting styles, yet it maintains the original overall layout and beautifully appliqued flowers and vines. This program is available in April, 2019. Reserve your spot now, and let us know when you want to start. We'll cut your kit and put your name on your bag to save it for you! 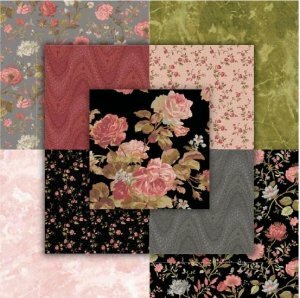 This program is a complete program, similar to all other Fabric Essentials programs, and includes our exclusive cutting diagrams, Backing and a generous fabric cuts! The 12" blocks (sewn in Months 1 through 12) represent the Court, with a special 24" center block representing the Queen herself. 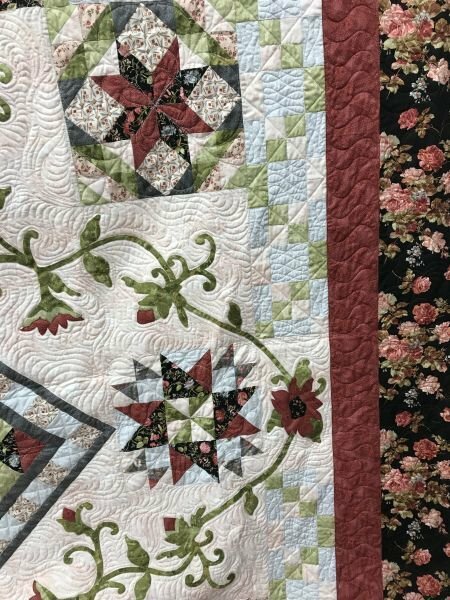 The applique and checkerboard setting enhance the monthly blocks, creating a true heirloom quilt. 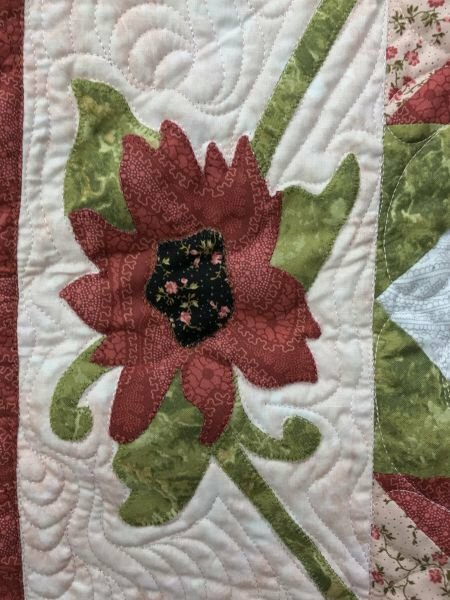 The applique flowers are easily created in individual block form, and then they are connected with vines during the quilt construction. Applique can be done by hand or fused a shown on the front cover of the pattern. Finally, the setting checkerboards employ a strip piecing method for a faster finish. This second photo shows the stitching used on the raw edge applique. This could also be needle turned. 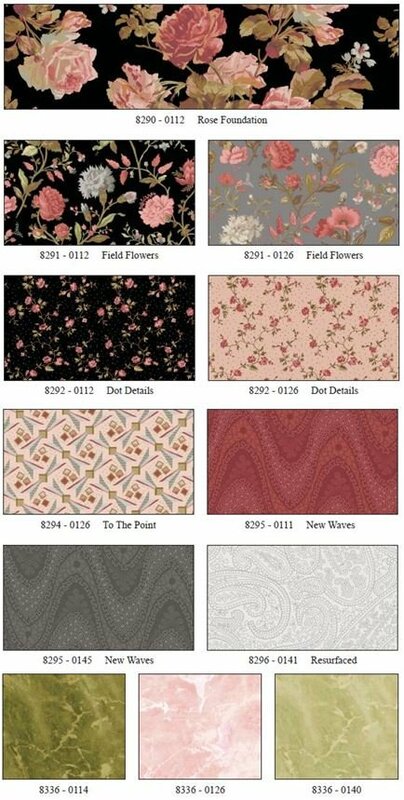 Queen & Her Court II features selected fabrics from two Marcus Fabric Collections: Impromptu Mix & Just Mined.